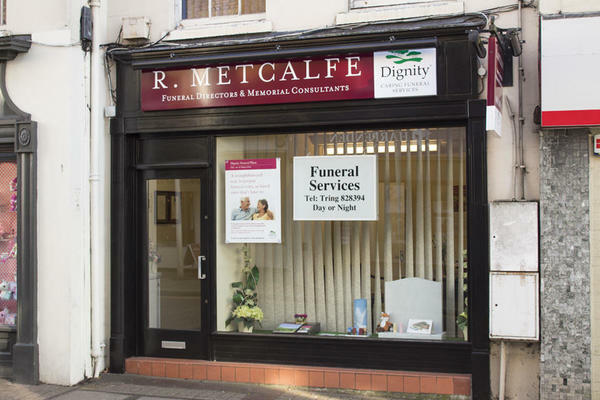 R Metcalfe Funeral Directors in Tring are here for you during your time of need. We can advise, guide and support you to make things a little easier during this difficult time. Established in 1986, we have served families from in and around Tring for over two decades, including New Mill, Hastoe, Wigginton, New Ground, Dancers End, Drayton Beauchamp, Wilstone Green, Tringford, Bulbourne Northfield and further afield. Being trusted with your loved one's funeral arrangements is an important duty and we would be privileged to help you organise something sentimental to your loved one. We will listen to your every thought, and use many years of local knowledge to co-ordinate a fitting tribute to honour their life. Please give us a call at any hour. We are here for you every step of the way. Call us today on 01442 828394 to talk through your personal requirements. At R Metcalfe Funeral Directors, we understand how special life is with those that you love. For us, every funeral is unique and personal. We have a service to fulfil every wish, with every detail carried out with the same uncompromising quality of care. From a traditional service, to a colourful woodland burial, your options are limitless with our Full Service Funeral. If you have a little more flexibility when it comes to arrangements, then we can provide a Simple Funeral for a lower cost. There is paid car parking available on surrounding streets, around 500 yards away. You can find our funeral home next door to the Post Office and opposite the Bell public house. Our staff are available 24 hours a day on 01442 828394 if you require our services outside of these hours.